run to the ground- BLOOD FOR THE BARON!!! Can anyone tell me where this story is in the archives please? It's here, part of the first "Coils of the Serpent" storyline. There is a reference list here. Made me appreciate my Eel toy more back in the day. I have Marvel AF issues #1 and #2 (and a couple of others with my letters in!) but don't have my #3 anymore. The story was reprinted in an issue of GI JOE "European Missions" though. Which issues were you printed in? That's cool! #9 is my first one - "Paul Kinnear, New Ferry, Wirral" is praising the UK strip but wondering why Cobra Commander has got a rag on his head as opposed o his mirrored helmet (I wasn't aware of the 'ceremonial hood' look at that point!). 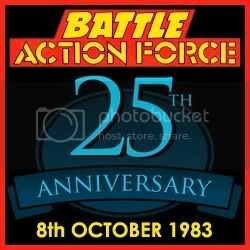 Next is #32 in which I moan about the "Master of Kung-Fu" strip and how it shouldn't be in a comic called 'Action Force'. I actually had a third printed (they can't have got many letters then!!) but I don't have that one so can't remember the issue.